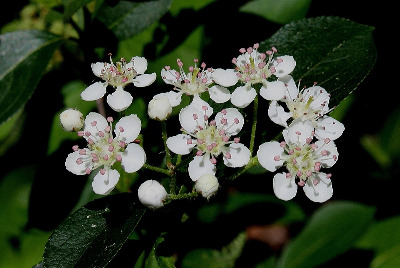 This must surely be about as widespread a wetland shrub as any in the state, occurring throughout in bogs, tamarack swamps, boggy swales, marshy and swampy thickets and shores, and moist ground generally; occasionally in moist to dry sandy oak-pine forests. Completely glabrous plants have often been recognized as A. melanocarpa (Michx.) Elliott. Some authors believe that pubescent plants are derived from hybridization of the glabrous A. melanocarpa with A. arbutifolia (L.) Elliott, a red-fruited species of the Coastal Plain and southeastern United States, disjunct to one site in Michigan, which has leaves densely pubescent beneath, and would recognize the pubescent hybrid A. ×prunifolia and the glabrous A. melanocarpa in Michigan. Since the alleged hybrid does seem to form independent, self-reproducing populations, it is tempting to recognize it as a stabilized species of hybrid origin. However, it seems to grade insensibly into the glabrous plant and the separation of completely glabrous plants from somewhat pubescent plants would be arbitrary. The fruit is black or dark purple, and puckers the mouth when raw (like the choke cherry, Prunus virginiana). MICHIGAN FLORA ONLINE. A. A. Reznicek, E. G. Voss, & B. S. Walters. February 2011. University of Michigan. Web. 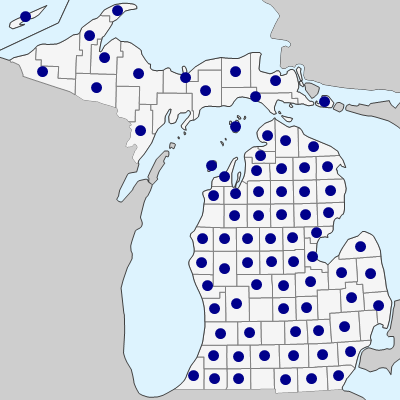 April 21, 2019. https://michiganflora.net/species.aspx?id=2427.